Moving Tires The Easy Way! The Tire Taxi™ is specifically designed to make moving tires and wheels through storage areas and service bays simple, fast and safe. It increases shop efficiency and productivity while decreasing injuries and promoting safety. The Tire Taxi (JDI-TT1-EX) is an extended version of the original Tire Taxi. Designed to create a more ergonomic working height, the Tire Taxi EX has four legs that extend the overall height to 23". Equipped with four (4) heavy-duty casters and a load capacity of 265 lbs., the Tire Taxi can move up to eight (8) tires or four(4) tire and wheel assemblies. 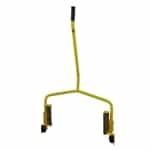 Its many uses include moving tires from the storage area, transporting wheel and tire assemblies from the vehicle to the tire changer, and stacking tires for display purposes. The versatility of the Tire Taxi makes it an indispensible tool for any tire or service shop. Weight (W/O Tires): 26 lbs. Tire Taxi EX has four legs that extend the overall height to 23"
The Tire TaxiTM is specifically designed to make moving tires throughout the service bays simple, fast, and safe. The safe, ergonomic and more efficient method for handling and transporting wheels and tires.